SPARTA — Cannon County's girls are one win away from playing in the TSSAA State Tournament in Murfreesboro next week. The Lionettes defeated Upperman in overtime 47-46 here Wednesday night as Chelsey Payne hit the winning 3-point basket with 32 seconds remaining. Taylor King sealed the win with a blocked shot in the closing seconds to give Cannon County the Region 4-AA championship. The Lionettes will play McMinn Central Saturday night at home in he Sectionals, with the winner going on to the state tournament at Murphy Center at MTSU. Tickets are $7. Gates pen at 5:30 p.m. Game time is 7 p.m. 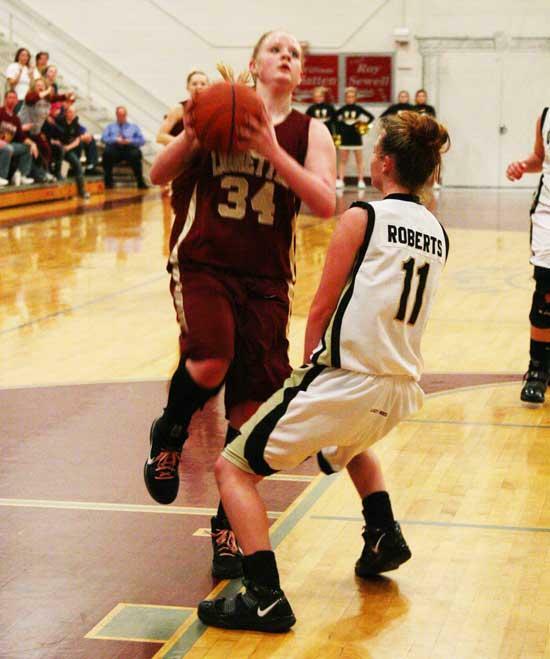 It was the first win for the Lionettes (27-4) in four tries against the Lady Bees this season. Cannon trailed most of the game. The Lionettes fell behind 14-5 at the end of the first quarter but battled back to within six at the half, 25-19. Cannon County made its charge in the third, outscoring the Lady Bees 14-6 to take a 33-31 lead heading into the final quarter. The teams swapped the lead three times in the fourth before ending the period with a 40-40 stalemate. McMinn Central was a 37-30 upset loser to Polk County for the Region 3-AA title Wednesday. The loss ended a 28-game winning streak for the Chargerettes, who will bring a 29-2 record to Woodbury Saturday. Polk County will host Upperman in the Sectionals. Chelsey Payne (34) was named Tournament MVP. Named All-Tournament were (from left) Emily Sissom, Taylor King and Ashley Campbell. Chelsey Payne named Tournament MVP. You make us so very proud at CCHS. Congrats.